A mysterious ghost takes advantage of the situation and uses the rift between Joanna (AiAi) and Lavender (Cherry Pie) to trap the soul of Joanna’s mother and find a long lost treasure. Will Joanna and Lavender finally learn to forgive and forget their fight when their lives are put at risk? What is Kwatzy’s connection in the mission of the mysterious ghost? 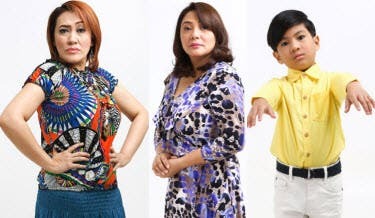 Together with AiAi, Izzy, and Cherry Pie in “Wansapanataym Presents Moomoo Knows Best” are Carla Martinez, Marco Gumabao, Michelle Vito, Jojit Lorenzo, Lui Villaruz, and Tony Manalo. It is written by Arlene Tamayo and directed by Erick Salud. Don’t miss the continuation of AiAi, Cherry Pie, and Izzy’s month-long Halloween special this Saturday in the storybook of Pinoy kids, “Wansapanataym” after “TV Patrol Weekend” on ABS-CBN. For updates, log on to www.abs-cbn.com or follow @abscbndotcom on Twitter. determine the popularity level of business in respective niche. and you might not even want to put it on continuously.